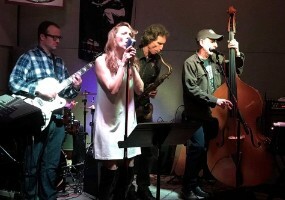 Virginia and The Slims started in Summer of 2013 with Virginia DeMoss on vocals, Perry Lavin on drums, James Kamp on tenor sax, Harry Schaefer on bass, Ginger Drake on alto sax and myself, Sean Anderson, on guitar. Virginia's husband came up with the name and we loved it. The idea was to play blues but to play songs people would respond to, especially swing or jump blues as no one else locally was focusing on that.